Audiofile Engineering has updated its field recording iOS app, FIRe, to version 2. 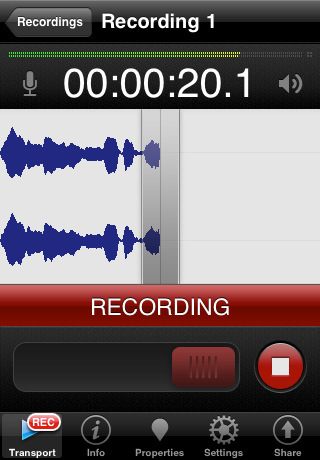 FIRe is designed to turn an iPhone or iPod touch into a professional-level portable audio recorder. FIRe 2 is available now in the App Store for $5.99. I registered my 3gs phone on 11th of april evening.After a long discussion ATT employee gave me case# and asked me to wait till 19th april.To day i just inserted tmobile sim and tried.Intially it says activation required.When connect to itune it displays a message’Congrautulation !your phone is unlocked.immediately Tmobile signal started..I was so happy…..thanks to ATT and other in the Forum.